dont ask me why they're called cakes. the sure look, taste and feel like cookies to me! and so the quest continues with finding the right balance between assorted gluten free flours. i made two batches of mexican wedding cakes this past week. i forgot just how good these small bites are - they remind me of cinnamon toast crunch. on my first go-round i used 1/2 walnuts + 1/2 pecans - as i didnt have enough pecans to make and entire batch. i think the walnuts made the cookies crumble a bit more than i would have liked. the last batch i put together only had pecans - mmm mmm good. i've been enjoying these with chocolate puerh tea - a post fermented tea that liz recently turned me onto. in a food processor (if you dont own one - GO BUY ONE! i use mine daily) pulse pecans, a/p flour, sorghum, xanthan, cane sugar, cinnamon and salt until the mixture is coarse and mealy. add in palm shortening and pulse until ingredients are well combined and appear dough-like. turn mixture out onto saran wrap and flatten to 1/2 inch thick circle - wrap completely and place in fridge until the dough is firm - this can take anywhere from 30 to 60 minutes. preheat oven to 325 and place the two oven racks in the top and bottom 1/3rd of the oven. using two cookie sheets create 24 tbsp sized round balls and space them 1 - 1+1/2 inches apart from one another. place one cookie sheet on top oven rack, the other on the bottom oven rack - bake for 12 minutes then rotate sheets top to bottom (and front to back) - bake another 12-16 minutes until edges just start to turn golden. remove from oven and allow to cook on cookie sheets around 5 minutes - transfer to wire cooling rack and allow to cool completely. 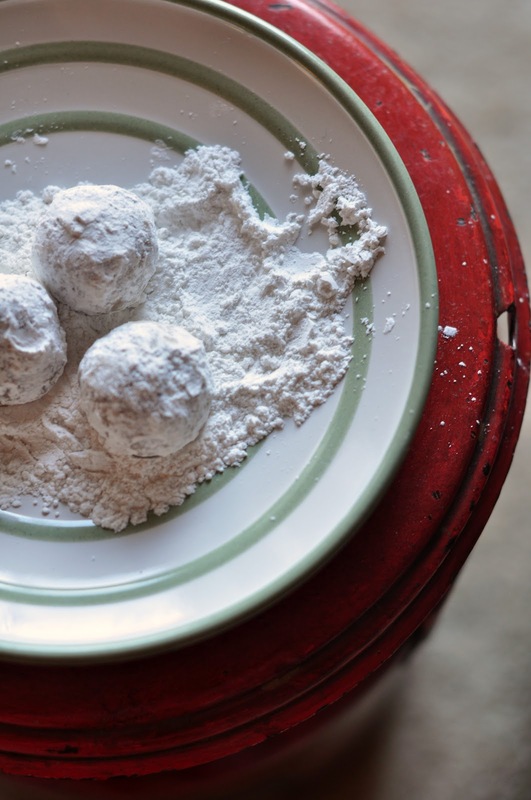 once cookies are COMPLETELY cooled place confectioners sugar in a bowl and toss each cookie in it - rolling them around to coat them well. smiles. another gluten free goodie.